Bihar Board Name Correction, Bihar Board Certificate correction or Procedure to correct name in Bihar Board certificate, Bihar Board Marksheet correction and Bihar board Document Correction are you searching. Here is the solution about how to change a name in Bihar Board Certificate, BSEB Certificate Correction 2018, Registration/ Admit Card/ Marksheet Bihar board wrong spelling how to correct and BSEB Certificate correction helpline. Some of the Intermediate and Matriculation Students in their certificate get issue regarding correction in Name, Father’s Name, Mother’s Name and another correction issue like date of Birth correction and getting duplicate. The issue of Intermediate and Class 10th certificate for easy to get and procedure for it has been mentioned here. Have your issue New/Duplicate Marksheet of Bihar School Examination Board: BSEB now solution for can be divisional wise. Now BSEB has been made an issue to correction in Registration Card or Issue or re-issue of Certificates. From 19th March 2018 (Monday) BSEB is going to close the counter for issue Certificate at BSEB Head Office area Patna. For an issue of Migration, Provisional, Marksheet and issue of the Duplicate certificate and correction in Certificate can be done divisional wise. We on this website where you can contact for the issue regarding Correction in the Registration card, Admit Card or other documents like NAme Correction, Father’s name & Mother name spelling correction and Date of Birth from students their respective School/college Divisional address contact and solve this issue. Apply for it and Within Some hour after completing the process Correction will be done and You can receive an application. Document Managment System is software which has been developed by American Base Company to handle issue regarding an issue of Certificate. This application is work to access the details from the headquarter to divisional. Through this Service now students can get a correction in the certificate without going to Patna head office. + I have to correction certificate & registration my name is not correct, how to make the correction in this. + My Matric Mark Sheet Wrong Name who right it? + BSEB Migration Certificate lost how to get other/duplicate. + I have to make the correction in Intermediate Certificate In Matric Certificate Kumar is added but in Intermediate not. Some of the Spelling mistakes in my all Inter certificate Registration card, Marksheet & Provisional what is the process to correct it. + My School staff is saying the correction in the name in my certificate can be done from Patna, what to do. Answer: Solution- Aspirants those have such issue they can write an application for regarding their issue to respective school/College from where admission has taken. Verify the details which are mentioned in application from your school/College/Institute and go to the Divisional office of BSEB according to Bihar Board School Examination Board, Patna directed. Give application and after the process, within some hours your correction or another issue regarding Certificate will be solved. If you wish to know any more about the correction about the Bihar Board Certificate correction or issue of duplicate certificate then ask through the comments. How many days take time to major correction not minor correction intermediate…..
My daughter passed 10th class in 2018 as private candidate from munger district from Bihar board. How I can get migration certficate. 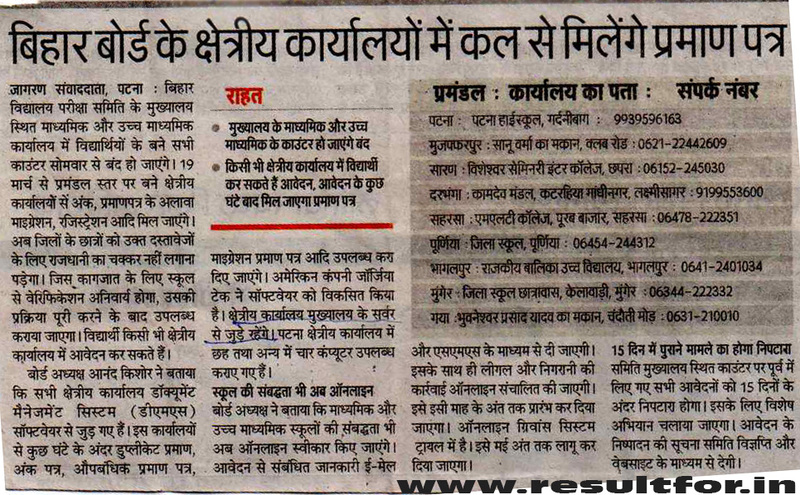 you can contact respective school where you have applied for participate in exam. Ha . Iske liye BSEB Divisional office se sampark kare, pahle school/college se sampark karke application forward karwaiye. Sir I have lost my i.sc Mark sheet, provisional, Migration certificate. First register an FIR in your Police Station and then go to the respective school/College and write an application for it to principal and forward it to the divisional office for issue duplicate certificate. sir,father’s name in the all documents of 10th is incorrect. how can i correct it? Sir mere 10th ke documents me date of birth wrong hai…Sir maine 2015 me 10th pass kiya tha tb se lekar aaj tk board office ke chakkrr lga rha hu or wo ab jakr bol rhe h ki ye yaha se thik ni hoga ab tum divisional office jao !! Sir 3 saal ho gye hai Abhi tk thik ni huaa…sirYe thik to ho jayega nnn ya phir hmesa ye wrong hi rhega bataiye nnn please !!! Please please please please please please please please please please please please help me sir !! apne school ke principal se sampark kare aur application divisional office ke liye forward karwaye, waha se sahi ho jayega iske liye Affidavit ke saath challan katwana hoga. Iske liye apne school / college se sampark karna hoga sabse phle. Online vidharthiyo ke link open nahi rahta hai. certificate me address se koi phark nahi parta hai. kahi ka phi rahe. in which certificate. DOB will consider which are available on 10th Class Marksheet. Sir mai 2005 ka 10th passout hu…mere father name me only one letter ka spelling mistake hai…aur middle name and last name ko joint kiya huwa hai…mujhe correction karwani padegi kya?agar haan to iska process bataiyega Sir. Sir mai 2005 ka 10th passout hu…mere father name me only one letter ka spelling mistake hai…aur middle name and last name ko joint kiya huwa hai…mujhe correction karwani padegi kya?agar haan to iska process bataiyega Sir.aur maine original certificate pe lamination v karwaya huwa hai…isko nikalwana padega ya new certificate issue hoga. kaun se year me pass huye hai. Sabse phle aap apne school jaye waha application likhe aur principal se divisional office BSEB ke liye forward karwaye awam court se affidifiate banwaye aur divisional me jama kare. Wha challan katega phir 1 week ke andar sahi ho jayega. Sir my father’s name is wrong in my 12th registration card, admit card, mark sheet ,provisional and migration certificate . I pass the intermediate exam in 2018. I need to correction my father’s name .my father’s correct name is Birendra Kumar sah but wrong name is written that is Birendra prasad sah so I want to correction name and how much time it took for correction. Sir please help me. Sir,what time is taken BSEB divisional office for correction my father’s name. I need documents for applying it in graduation registration. Sir please help me. how to get intermadeiate duplicate marksheet after lost of marksheet. 1.mujhe father’s name corection karwana hai. 2.mujhe original marksheet Lena hai.mere pass tha lekin wah pani me galker nast ho gaya. 3.all certificate me name father name corection hai. 5.May school se forwading karba liya hu aur public noteri se hafidifit v karba liya hu…kya mujhe aur kuch karane ki jarurat hai kya ye sab kafi hai….please advice me…..?????? Ab Bihar board ke doara banaya gaya divisional office me jaye. Divisional official se hi hoga. Iske baare me humne 17 January ko BSEB Patna se pata kiye hai. May BSEB patna gaya tha to unhone divisinal munger bataya aur unhone kaha aap munger jayenge waha se email karenge to May yaha se email karunga same date me ho jayega…. Mai bhi BSEB Head Quarter se pata kiya hai, Ab jitne bhi kary hota hai ab sab divisional office se hi hota hai. ab correction ka kary divisional office se hota hai, puri parkiya ke liye apne college/school se sampark kare. Please reply jarur kijiyega kyonki problem bahut bada hai mere 10 th ke certificate me by mistake fathers name galat likha gaya hai school gaya tha application forward karane unlog verbaly bol rahe the nahi hoga 1 year tak mujhe ghumaya gaya. principal sayad rule regulation nahi janti hai bol rahi hai ab correct nahi hoga. Board wala bol raha hai bina forward ke o kuch nahi karega. koi writing me kuch nahi de raha hai jila ke DEO se bhi milne ki bahut koshish kiya koi response nahi Bihar Borad ka chairman verbaly bola bas pahle school tab yahan. Bahut RTI ksrne ke bad achool se application me likha gaya ki forward nahi kiya ja sakta hai. aur principal ne sign mohar diya. umka kahna hai admission register ke anusar aapka fathers ka name sahi hai. but admission register me hi inhone school administration ne galat likh diya hai. mera purana TC jisse maine admission liya tha class six me o mere pass bhi nahi hai aur school bol raha hai uske pass bhi nahi..
papa ka real name jo hai means correct name unke service book, pan card voter card adhar card educational certificate me o mere tenth ke certificate me nahi hai ek word new add kiya hai mere tenth ke certificate me. ab mai kya karu kindly guideline dijiye..
forward nahi kiya ja sakta wala application par board kuch nahi kar raha..
ab mere pass kya rasta bacha mera life hell ho gaya..sucide karu ya kuch aur court ka rasta hai kuch log bol rahe hai kidly clearify koun sa court jaun district court ya highcourt.. Bhojpur jila aur bihar board ki bat hai..school hai ara me..
During Nomination in college and registration at both time the title of my father’s name was changed how can I correct my father’s name? First, go to school & write an application and from court make an affidavit for that then with the forwarded application by principal go to BSEB Divisional office. For completed information, you can contact your school. Sir please bataiye hm ab kya kre?? I told you which was the procedure for earlier correction. In this case, you can contact your school/college principal. Please note:- We are not official administration, We are a blogger and provide information after collecting over the internet. In this case, only official administration can guide you about it. To mere 12th ke sare certificate me mere Father’s name RAJU PRASAD ho jayega? Sir ab Mai kya krun?